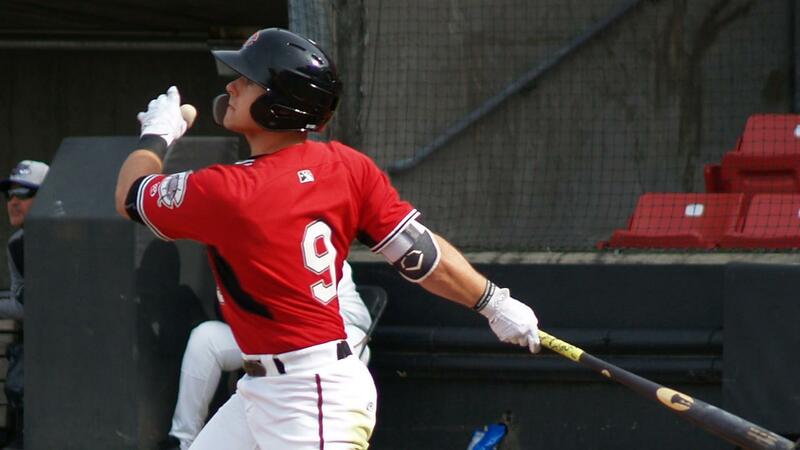 ZEBULON, N.C. - Cooper Hummel started the ninth with a double and went on to score from third moments later on a chopper to second from Nathan Rodriguez as the Mudcats walked-off for the tenth time this season, 5-4 versus the Hillcats on Wednesday night at Five County Stadium. Hummel started the ninth with his first of two doubles in the game before scoring moments later on the fielder's choice hit into by Rodriguez. The throw from infielder Tyler Friis and ensuing play at the plate nearly caught Hummel, but his feet first slide beat a tag by catcher Li-Jen Chu and gave the Mudcats (21-23, 55-59) the series finale victory. Reliever Leandro Linares took the loss for the Hillcats (26-20, 55-58) as he was the one who allowed Hummel's leadoff double to open the final frame. Linares (4-1, 6.04) was not on the mound, however, when Rodriguez forced in Hummel to win the game. The Hillcats had turned the game over to Nick Sandlin for the final play, but Sandlin came up short in retiring Rodriguez for what would have been the second out of the frame. Cody Beckman earned the win for the Mudcats after pitching the final two frames and totaling two strikeouts. Beckman (1-2, 5.73) entered the game in the eighth following a :33 minute rain delay (the game also featured a :45 minute at the start) and went on to pitch through two scoreless frames while earning the win. Beckman also followed reliever Rodrigo Benoit who began his Carolina League debut with five straight strikeouts before allowing a triple to Chu in the seventh. Benoit then allowed Chu in from third on a wild pitch with two outs in the seventh as the Hillcats tied the game at 4-4. Benoit finished his debut with six strikeouts and just the one run allowed on three hits. Victor Diaz started the game for Carolina and pitched through the fifth while allowing three runs and four hits. He gave up a two-out run in the first on a run scoring hit from Nolan Jones and later gave up a game tying two-run single to Jorma Rodriguez in the fifth before leaving the game. The Mudcats answered the first Lynchburg run with two runs in the third and then extended their lead to 3-1 after getting one more across in the fourth. Lynchburg locked at 3-3 in the fifth after getting their two-run hit from Rodriguez, but Hummel broke the tie with a go-ahead RBI double in the fifth to lift the Mudcats to the lead again. Sam Hentges started the game for Lynchburg and finished with a no-decision after picthing through four plus innings with four runs (three earned) allowed on four hits. Hentges also walked five and struck out six. Carolina's first runs of the game came in the third when Demi Orimoloye forced in a run with a RBI groundout to third. A throwing error on the back end of that same play from first baseman Anthony Miller scored another run in that inning and gave Carolina a 2-1 lead. Ryan Aguilar then scored in the third after reaching on a double and scoring moments later from third on safety squeeze hit into by Rob Henry. The Hillcats eventually tied the game at 3-3 in the fifth, but Hummel broke that tie with a RBI double to left while putting Carolina up 4-3. Lynchburg led once and tied the game twice, but ended up with the loss while falling a win shy of a series sweep. The Mudcats had just one hit with a runner in scoring position and stranded 12 in the game, but ended up with the series finale victory while finishing at 2-4 in their six game home stand. The Carolina victory snapped a four game losing streak for the Mudcats and came before the club's scheduled day off on Thursday. The Mudcats will return to action on Friday in Salem with the first pitch scheduled for 7:05 p.m.